My first ride on the Fuse took place on a trail that starts out flat from the parking lot for a quarter-mile before pitching steeply uphill. As I looked down at the big, honking 3-inch tires under me, then up at the wall looming ahead, my cold leg muscles tensed. I put my head down and mentally prepared for what I figured would be a slow, lumbering slog to the top. You know the saying, "Don't judge a book by its cover?" It applies here, big time. The Fuse climbs incredibly well. The added traction from the extra-fat tires was to be expected, but I incorrectly assumed that it wouldn't accelerate quickly or have anything approaching a sprightly demeanor–it does both. The combination of fatbike-like traction and trail bike-like handling gives the Fuse a unique set of skills. Climbing becomes a game to find the steepest, most diabolical lines to test just how much traction there is. Granted, the 6Fattie tires, as Specialized calls them, are a little sluggish compared with normal 2.3-inch-wide rubber, but for the little extra effort it takes to turn them, they save energy in comfort and traction. At 14 psi, I was able to remain seated and pedal through much more terrain than with an ordinary hardtail. Unlike most hardtails, on which technical climbs require an awkward balance between seated and standing to find the right power-to-traction ratio, you can pretty much sit down and pedal up anything on the Fuse. Also, you don't have to be as concerned about breaking traction when climbing out of the saddle. It's almost like a full-suspension bike in that way–only in that way, really. While the plus-size tires do add a ton of capability, don't expect the Fuse to feel anything like a full-suspension bike. 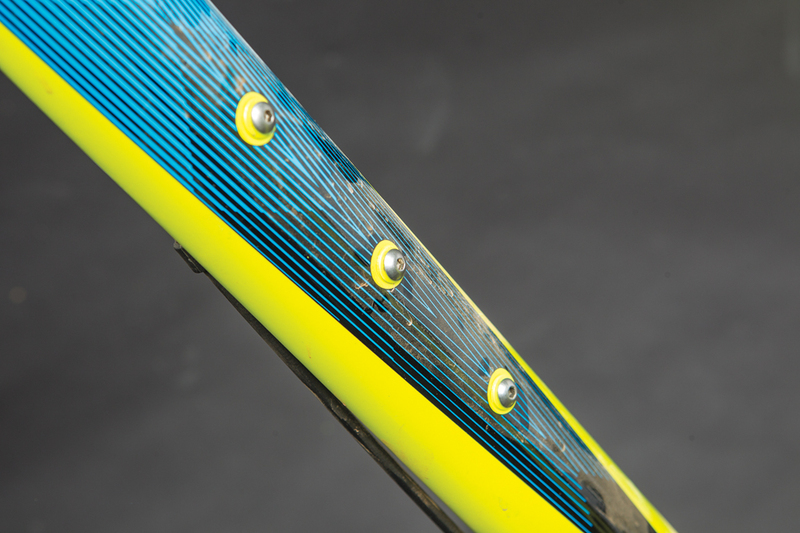 The unique-looking ‘Diamond Stay’ design allowed Specialized to squeeze plus-size rubber into 16.9-inch-long chainstays. However, it is surprisingly fearless for a hardtail, and playful too. Specialized equipped the Fuse with 16.9-inch chainstays and a super-low 12-inch bottom-bracket height, making the bike easy to coax from one corner to the next. It's a piece of cake to manual through whoop sections, too, and it will even handle a jump with dignity (though the big tires make it feel a bit weird in the air). I was able to ride all the same terrain I take 5-inch full-suspension bikes on, only losing momentum when things got extra chunky. The 67-degree head angle is slack enough for steep downhills, yet not so slack that the Fuse wanders on the steep climbs onto which its tires will cling. Our size large sports a 25-inch toptube, making it plenty roomy for short stems. Between its five sizes, from small to XXL, the Fuse ranges in length from 22.6 to 26.7 inches and comes with a 45-, 60- or 75-mil stem–a broad range for a bike with broad capabilities. Because it's not nearly as cumbersome to ride as a full-on fat bike, I'd argue that the Fuse (and similar bikes) performs better on a wider range of terrain. It will go to nearly all the same places a fat bike can, but with the ride-ability of a normal bike. Also, the triple-boss water-bottle mount on the downtube will fit a Salsa Anything Cage, making it an attractive choice for multi-day rides. The frame is stiff and light, providing a snappy, lively ride that many other bikes at this price can't offer. The elegantly formed tubes, dropouts and chainstays, as well as the clean internal cable routing show that no shortcuts were made in the design of this aluminum frame–except maybe one: the press-fit bottom-bracket shell, which ought to be threaded. At $2100, the Fuse Expert is spec'd well. 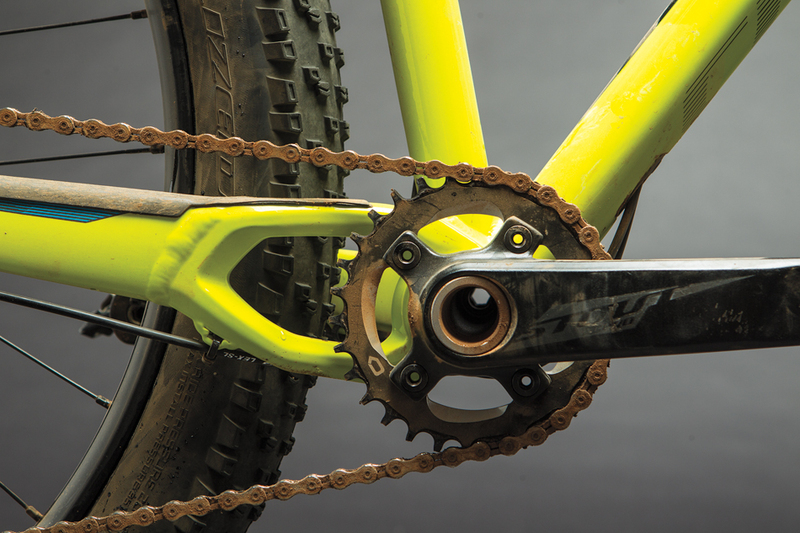 The drivetrain consists of a SRAM GX shifter and derailleur, a 10-speed Sunrace 11-40 cassette and a Specialized Stout crank with a 30-tooth ring. For a drivetrain that consists of a potpourri of parts, it actually performs quite well, knocking off shifts quickly and accurately (when the stock Jagwire shift housing is swapped out for Shimano). 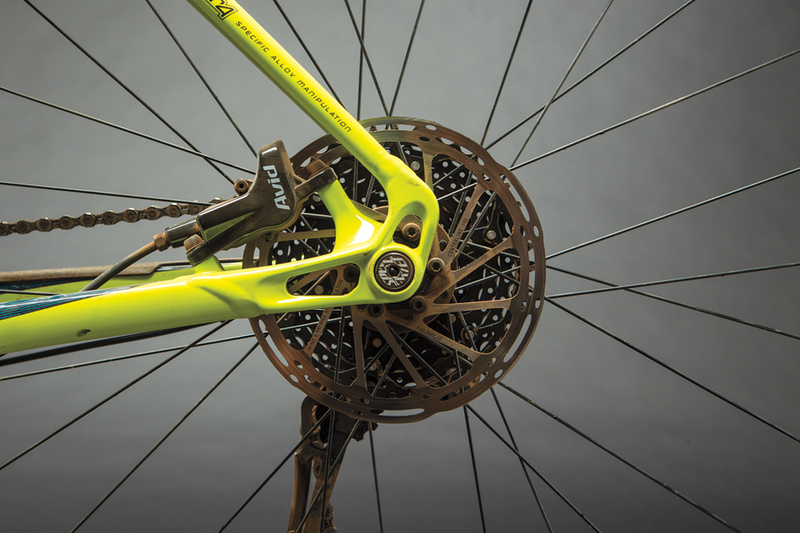 The 120-mil-travel TransX dropper isn't as refined as other higher-end options–it requires a crazy amount of weight to drop it all the way down–but we didn't have any reliability issues with ours. The 45-mil-wide WTB Scraper rims give the Specialized 6Fattie 27.5×3.0 tires a nice shape, but they took a pretty good beating while we experimented with tire pressure. We've been pleased with the performance of the Manitou Magnum Pro fork in the past, but the Comp model spec'd on this bike had more stiction, even after servicing, than we would have liked, and it lacks the more refined feeling we've experienced on the Pro. A fork upgrade would go a long way on this bike. A pair of Avid DB3 brakes stops this balloon-tire bike, and they showed great power and consistency for stoppers at this level. So, who's this bike for? Hardtail lovers looking for a new bike should seriously consider the plus-size category. Also, given its price and confidence-encouraging characteristics, the Fuse Expert is a worthy option for new riders.